As it roams over its range of 1.15 million square miles, living up to 30 years or more, the grizzly bear is one of the most feared and revered wilderness animals—a true symbol of the Canadian Rockies. 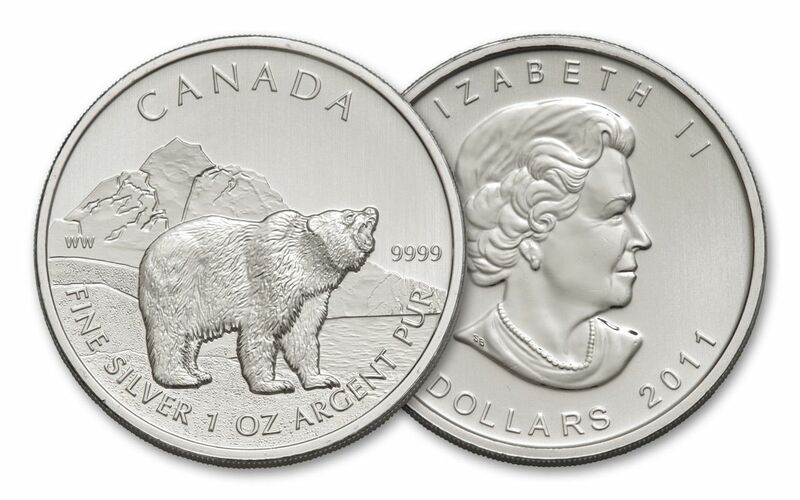 Small wonder that the grizzly bear was chosen as the subject for the third release in the Royal Canadian Mint’s six-coin "Wildlife Series." Introduced in 2011, this wildlife series of coins have become perennial market favorites, and feature six different Canadian wildlife species: Timberwolf, Grizzly, Cougar, Moose, Pronghorn Antelope and Wood Bison. These finely crafted bullion coins are struck from the same .9999 pure silver as the Royal Canadian Mint's world-famous Silver Maple Leaf bullion coins. 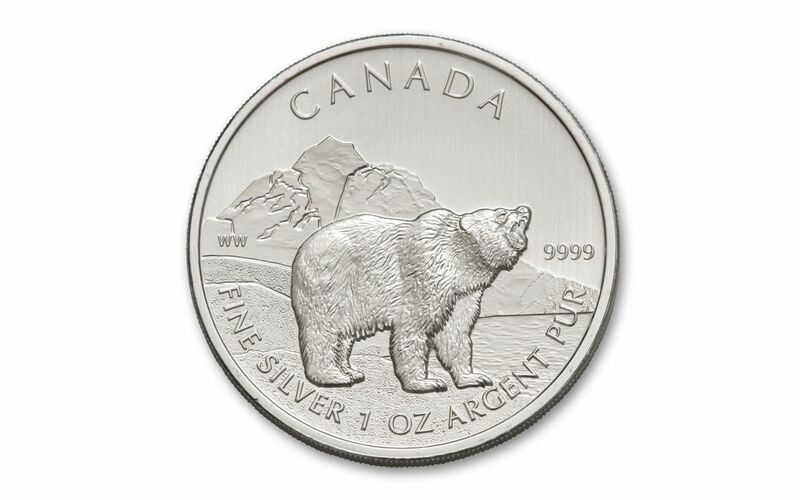 Now you can celebrate the beauty of the Canadian Rockies and add to your own wildlife collection with the 2011 $5 1-oz Silver Canada Grizzly coin. First-Year Edition Coins of Gorgeous .999 Pure Silver! You'll instantly feel the magnificence of your Canada Grizzly coin as you hold it in your hand, with its full weight of 31.1 grams and impressive 38 mm-diameter size. But that's only the start of what makes this coin a must-have for the serious collector. FIRST-YEAR EDITION COIN-- The Wilderness Series launched in 2011 with the Timberwolf and Grizzly coins, two titans of the Canadian Rockies. Your gorgeous .9999 pure silver coin features a reverse with the image of a solitary grizzly bear roaring before towering mountains. Inscribed on the reverse are the words "CANADA," "FINE SILVER 1 OZ ARGENT PUR," and the purity rating of 9999. The initials WW are also included for designer and Senior Royal Canadian Mint Engraver, William Woodruff. 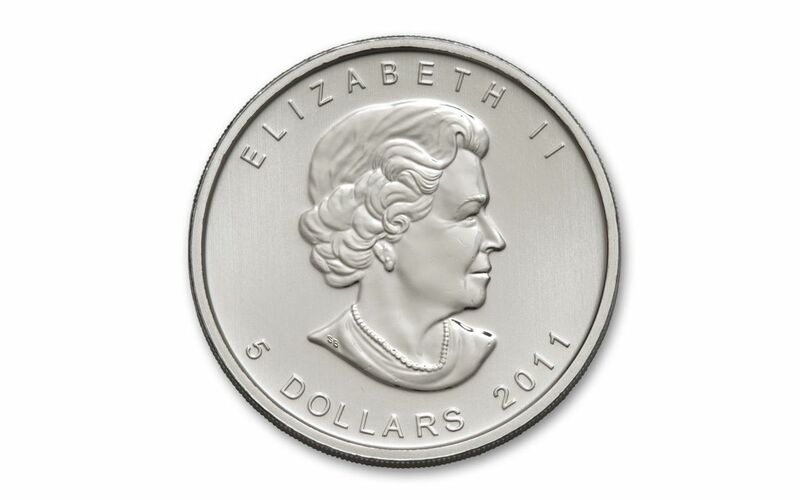 The obverse of the coin depicts Queen Elizabeth II facing right, a design which was created in 2003 by Canadian portrait artist Susanna Blunt. Also, inscribed on the reverse is "ELIZABETH II," "5 DOLLARS" and "2011." BRILLIANT UNCIRCULATED COLLECTABILITY-- Your coin is certified in brilliant, uncirculated condition, accompanied by a Certificate of Authenticity and housed in a plastic vinyl flip case. Coins of this grade appear exactly as they left the mint, having never been used in commerce. GENUINE LEGAL TENDER -- This coin isn't just another pretty face, it's genuine legal tender of $5 Canadian. From the wilds of Canada directly to your doorstep, the $5 Silver Canadian Grizzly Coin is available now…but competition is fierce. Get yours from GovMint.com before they're gone!